What’s the role of the Citizen Council? Above all else, it’s a chance to get your voice heard. When we were dreaming of Tau Station we dreamt of a universe we could live in. We can only achieve that by listening to you, by doing it with you. We want more communication, more exchanges. Not just listening to the Citizen who makes the most noise, but a chance to hear all your voices, to help you discuss together what you want to see happening. We would like you Citizens to discuss various topics with each other and with the elected Council. For this, the Council will have its own forum. Topics for discussion can be raised on the forum by either a Citizen or a Council member. That topic must be open for discussion for at least 7 days before it can be put on the Council agenda. Once the topic has been open for discussion for at least 7 days a Council member or a Citizen can request it to be put on the Council agenda without the right for the Council to refuse. When a topic has been put on the Council’s agenda it will be discussed and voted on by the Council to determine whether a topic will be presented to the Tau Station staff. Topics presented to the Tau station staff will be discussed with the Council. They will be either accepted or rejected in writing within 30 days at most. If accepted they will be put in the development process. To be able to vote, a person should have an active account, played Tau Station at least once in the past tenspan and be at least level 4. These conditions are here to avoid the creation of fake accounts created just for tipping an election. In addition to this condition, to be able to run, Citizens must be at least 21 years old, having time to invest in their role, not having banned from Tau Station for any period of time and being willing to sign a non-disclosure agreement. The election system is straightforward: the candidate with the highest number of votes is placed in first place; the second in the second place and so on until the 9 seats are filled. Places 10 to 14 will be used for “alternatives”. “Alternatives” will be available to fill in for a Council member if they cannot attend a meeting. If an “alternative” is needed the one that received the most votes will step in. It will not be possible to choose an “alternative” randomly. The Chairman of the Council will be the Citizen with the most votes. They will be allowed to step down and the Council members will be able to elect a new Chairman; if they choose to do so. The members of the Council will elect a vice Chairman, a secretary and a Vice secretary. Votes for these posts will be cast during the first meeting. 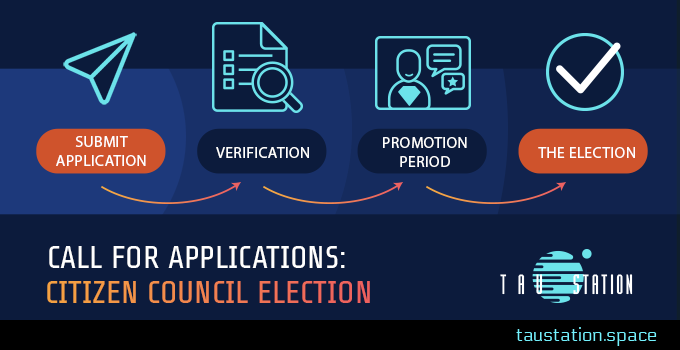 Elections will be kept as simple as possible, with 4 phases lasting 2 weeks each. The submission period where people can submit their application to become a candidate for the Council. The verification period where we will be matching candidate to the criteria mentioned above. The promotion period where community members/candidates will be able to write down their vision and to submit video for all Citizens to know what they stand for. The role of each Council member. The role of the Chairman will be: calling the meeting, chairing the meetings, setting the agenda… In other words, they will be the one organizing the meetings. The vice Chairman will assist the Chairman in general meeting management and act as a replacement should the Chairman not be available. The secretary will be responsible for recording the meeting minutes and making them public. The vice Secretary will assist the secretary and step in if the secretary cannot attend. I believe the Council meeting should he held at least every two weeks, but it will be left at the discretion of the Council. Council will meet with Tau Station representative every 2 months. Topics that will be presented to the Tau station representative will be put in writing and sent to Tau Station representatives at least one week before the meeting. The 1st of February is already tomorrow, therefore if you are interested in helping Citizens make their voices heard in the future development of Tau Station it’s time to get ready. The verification period will start on the 15th of February GMT (201.13/00:000 GCT) until the 28th of February GMT, end of day (201.27/00:000 GCT). The promotion period will start on the 01st of March GMT (201.27/00:000 GCT) until the 14th of March GMT, end of day (201.41/00:000 GCT). The election will happen on the 15th of March. Let us know if you have any questions, we will be happy to address them, and let’s take Tau Station to the next level together. By the way the next update will happen on Monday.